The Savin 8016 is a multifunction printer that has integrated scanning, copying and faxing functions, which are designed to provide the core of an office's digital communication and document processing system. This unit is designed to be efficient and reliable under heavy office workloads without compromising quality or consistency. Documents can be produced in hard copy form or sent digitally through an office network. An easy to use control panel makes operation convenient and fast, reducing wait times for offices that need to process documents on the fly or complete high volume jobs. The core engine of the Savin 8016 comes with a solid state scanning element with dry process, dual component image processing produces prints with a resolution up to 600 x 600 dots per inch with 256 levels of grayscale. Standard paper input capacity is 350 sheets, divided between a 250 sheet paper tray and a 100 sheet multipurpose tray. Model upgrades provide an optional increase of input capacity through an additional set of input trays, providing a maximum possible input capacity of 1850 sheets. 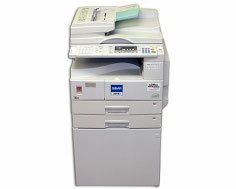 Copier warm-up time is less than 15 seconds, with a first copy speed of 6.5 seconds. 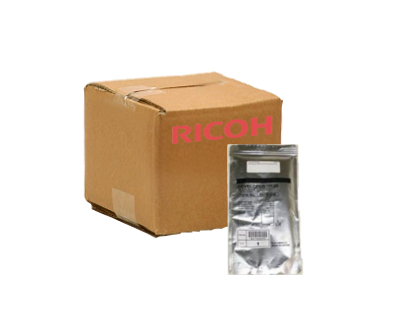 There are plenty of connection interfaces available for this model, which provide compatibility with any type of network and any type of computer or device, new or old.. Ethernet 10/100Base-T and USB 2.0 are standard. Optional interfaces include Firewire, 802.11 Wireless LAN, Bluetooth and Parallel. A wide range of computer operating systems are supported, including Windows XP, Mac OS X and Unix. The optional scanner module can scan documents at speeds up to 43 items per minute with an optical resolution of 600 dots per inch, and digital output can be saved and stored in TIFF and PDF formats. The Savin 8016 also has an optional fax module with a 33.6 Kbps business class modem that can transmit letter size documents at a rate of less than three seconds per page and can scan each page in less than one second. 3 MB of page memory can hold 240 sheets of digital fax document data. A built-in memory backup can store both incoming and outgoing faxes for one hour in the event of an emergency or power outage. Documents can also be faxed through a LAN network or sent to email. Two optional document feeders are available, making it possible to automatically load and scan both single-sided and double-sided documents. The Savin 8016 has a maximum print speed of only 16 pages per minute for the base model and up to 21 pages per minute with model upgrades, which is on the slow end for laser printers in this class, since the design is meant to provide reliability and consistency rather than speed. The standard output capacity of 250 sheets of plain paper is not upgradeable, requiring constant attendance on high volume jobs with thousands of printed pages. A two-digit quantity indicator only allows for a maximum of 99 copies, which requires constant reprogramming for high volume print jobs with one or two page documents. A maximum print resolution of 600 x 600 dots per inch is average for printers in this class, providing merely acceptable results when printing business documents such as memos, letters, invoices and reports. Graphic reproduction can look grainy and pixelated with the limited resolution and only 256 levels of grayscale. The NetBEUI protocol is provided for connection to certain networks, but an additional Smart Device Monitor needs to be installed on each client, making configuration slightly more difficult. The 192 MB of printer RAM that is installed needs to be shared with the copier, scanner and fax machines, which may not be enough for printer sharing through a network, and can cause frequent pauses and delays in carrying out jobs. 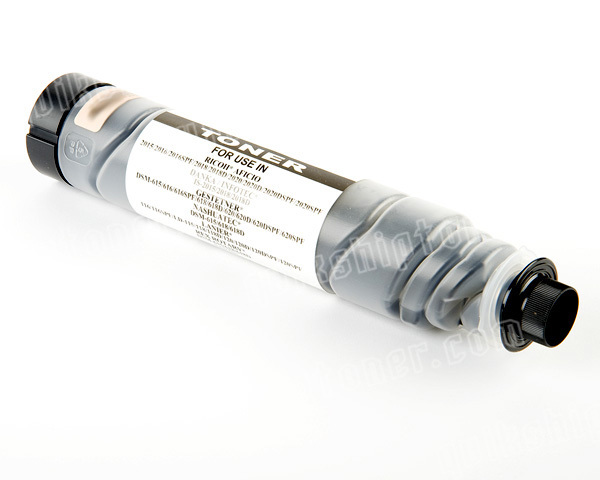 Review it: "Savin 8016 "
Replacement toner can be purchased for this model, in a refill bottle, which can restore a toner cartridge to a full yield capacity of 9,000 sheets. As with other Savin models, the drum is independent of the toner cartridge, allowing for maximum consumable usage and reduced costs. At average toner prices, pages can be printed at a cost of one cent for 5 pages.